Textiful integrates with MailChimp and allows you to sync collected email addresses and other information to the MailChimp list of your choice. First you will need to authorize Textiful to integration with MailChimp. Click the "Integrations" tab. Find the MailChimp section and click the link "Click here to integrate Textiful with your MailChimp account". You will be taken to a page asking for your MailChimp username and password. Enter your credentials to authorize Textiful to talk with MailChimp. Once Textiful is authorized, you'll need to enable and customize how email addresses are synced to MailChimp. On the keyword details page in Step 3, check the "Sync collected email addresses to my email list" box. Below that check the Sync Emails to MailChimp box. If you do not see the MailChimp checkbox, click the "Add more email integration options" link to go to the Integrations page and follow the instructions in Step 1 above. Click the "MailChimp" tab in the left hand navigation to view all of the MailChimp Sync options. From the dropdown, select the MailChimp list that you would like all collected email addresses to be added to. If your list also has Groups setup, you can select one or more groups that you would like emails to join as well. 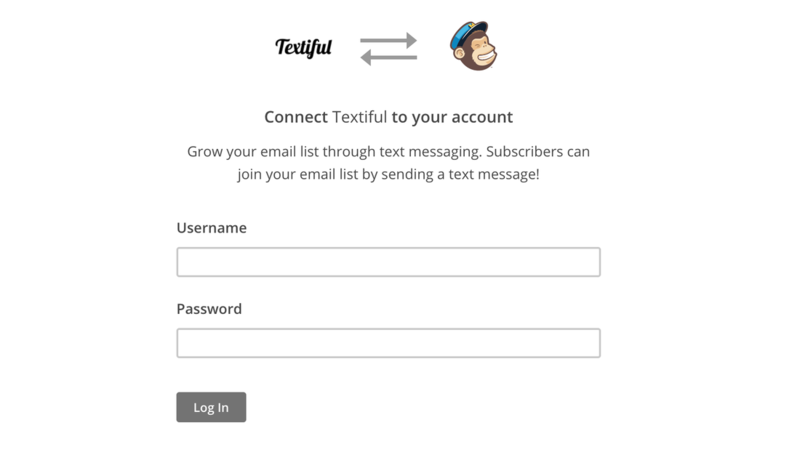 By default, Textiful will sync just the email address to MailChimp. 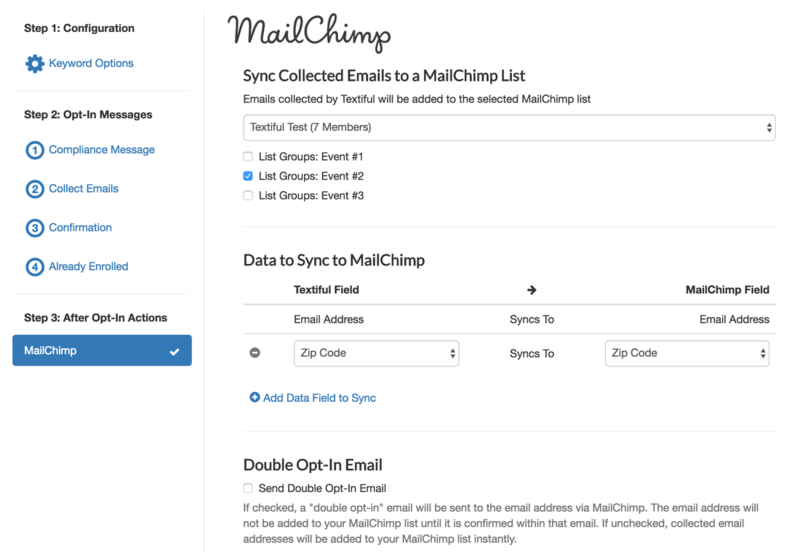 You can chose to have additional data to sync to the MailChimp list by clicking the "Add Data Field To Sync" link. Select a Textiful data field that you want to sync to the selected MailChimp merge tag. Please note: if your MailChimp has required Merge Tags, emails will not be synced if those merge tags are not selected. 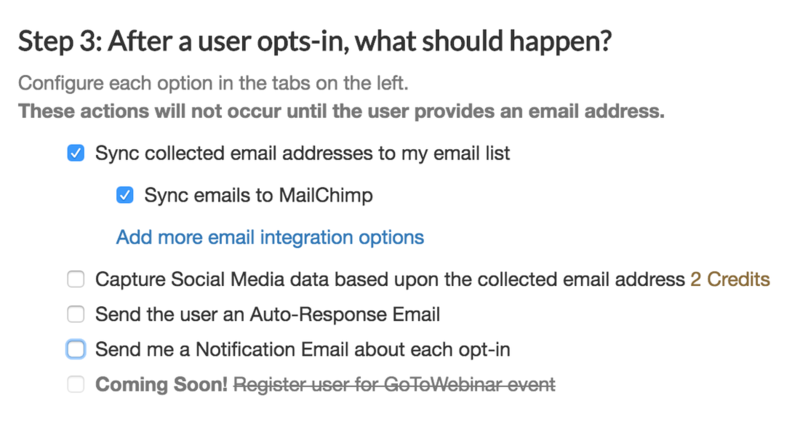 This option allows you to require new users to double opt-in via an email that is sent by MailChimp. Unless you have a reason for this double opt-in, it's recommended to leave this option turned off because it can reduce the number of emails that are ultimately added to your MailChimp list.